Anytime someone finds out I have a Kindle, they inevitably ask if I like it. I’ve been asked by friends, by family and even by total strangers. The thing is, I do love it. I don’t just love it. I LOVE it. It has revolutionized my reading habits, saved me a ton of money and despite my concerns about giving up “real” books, it’s kind of cozy to curl up with my Kindle (in its faux leather red cover!) to read. My entire personal library — save for 25 or so books that I purchased long before the Kindle was born and am not willing to give up — is at my fingertips with my Kindle. It slips in my bag, even when it’s packed full, and it’s easy to cart around with me. 2. Read in the dark. I purchased a cover and a light for my Kindle, which means I can read anytime — in the car, in the dark while my husband watches Monday Night Football, etc. I’ve never found a book light that I was really comfortable using, but this one sits securely inside my case and makes it easy to read in the dark. I know iPhones and iPads and even the newer Kindles allow you to connect to the web and social media, but I don’t want those features, to be honest. I like to just curl up with a book and read without distractions from the outside world. I have purchased three books for my Kindle in the year that I’ve owned it, and I currently have more than 200 in my queue to be read. I check for freebies every week on Amazon, and I doubt that I’ll ever have to buy another book in my lifetime. I’m sure there will be other books that I want to read, but I’ve also gotten some amazing freebies from my favorite authors. They have everything from fiction to business theory and devotionals. There are thousands of classic books that are now in the public domain, and many, many of these have been Kindle-ized. I think this will be very convenient as my kids get older and start reading these for school! 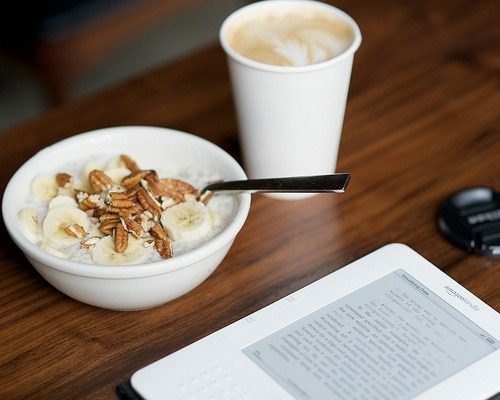 Not only does the Kindle hold your place — even in multiple books if that’s how you prefer to read — and sync them across devices (Kindle has apps for your PC, phone, etc. ), but it also allows you to highlight, add notes and create bookmarks for future reference, so you can access them all in one place. And finally, I love that I can add ebooks that I’ve purchased or downloaded from around the blogosphere and read them on my Kindle too. I spend all day on the computer and don’t particularly like reading longer essays and books on my big screen, but I don’t want to print them out either. The Kindle fills that gap for me. All in all, this is by far my favorite gadget, and I have no regrets about spending the money on my Kindle (other than the fact that the price is now much lower!). It’s been a great investment personally as I’ve gotten back into the habit of reading regularly. Do you have a Kindle? Is it on your wishlist? Next PostJoin AboutOne.com for Operation Give Thanks!